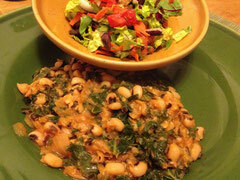 One of our standard meals around here is the Hottie Black-Eyed Peas and Greens in Appetite for Reduction. It holds a special place in my heart because it was how we discovered that Seth does in fact, like kale. You can use collards or kale for it, but I hate collards so I’ve always used kale. It makes a lot – 6 servings – and is so easy and delicious that it’s in regular rotation around here. I added a little more hot sauce this time (we like Hotlanta Hot Sauce, made right here in the ATL) so it was nice and spicy. I also may or may not have added a little extra liquid smoke. 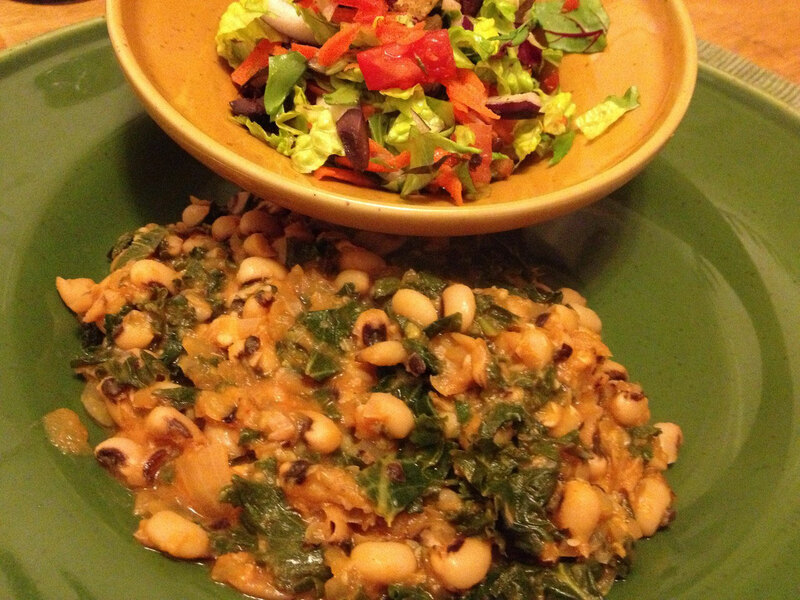 Really, it’s hard to go wrong with a whole bunch of greens, black-eyed peas and hot sauce. I thought about making some herbed biscuits from Vegan Brunch to go with this, but decided on a salad instead. We like to have an extra veggie as a side normally and it seemed like a healthier option than the biscuits. Still, biscuits would’ve made it a proper Southern dinner.